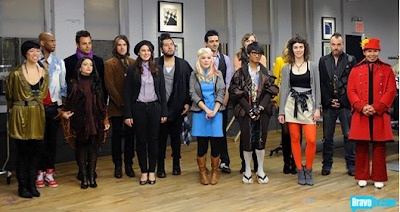 I've been going through Project Runway withdrawal. The Fashion Show is the fix I needed. So far, it looks like it's going to be good. After meeting everyone, they jumped into a mini challenge. The mini challenge was to create a LBD from a black t-shirt in one hour. This was a fun challenge so I look forward to seeing what other mini challenges are. The main challenge was a team challenge (way to make people hate each other right away) where the designers showed pieces in front of a room full of buyers and fashion "insiders" instead of just showing in front of the judges. These cast votes for the best team, and the judges made final decision. Each team had to create a must have item and five looks to feature it in. The teams were "Navy Bolero," "Harem Pants," and "Tube skirt/dress." Navy Bolero won. Tube skirt/dress lost. The Good: The designers seem like they have talent, some more than others. Isaac Mizrahi and Kelly Rowland did a good job hosting together (better than I expected). I love that more than just the judges look at the collections and offer feedback. Each week's winning look is sold online. There is no boring competition for the models; the show is just about design. Also, the judging is harsh. They don't hold back. The Bad: I miss Tim Gunn during critique time. I know I'll hear him saying "Make it work" in August, but I still miss it. Isaac and Kelly did fine, but they don't have anything on Tim. I still don't understand why Kelly is hosting. She wasn't bad, but she didn't add much either. The Ugly: Since there was a team challenge, people are ready to start killing each other. There will be fighting. I hope they don't focus too much on the bickering. A lot of the designers had great ideas with no sewing skills so things just came off looking sad. Tonight James Paul, who has worked with Vivienne Westwood, won with this dress (above) from team bolero. You can buy it here. Jonny went home with his tube skirt, silky black halter top look. It was a classic-ish look with no imagination, but he still couldn't execute it. Visit The Fashion Show on Bravo for videos and runway pictures.